Finders Keepers is a crime novel by American writer Stephen King, published on June 2, 2015. It is the second volume in a trilogy focusing on Detective Bill Hodges, following Mr. Mercedes. The book is about the murder of reclusive writer John Rothstein (an amalgamation of John Updike, Philip Roth, and J. D. Salinger), his missing notebooks and the release of his killer from prison after 35 years. The book's cover was revealed on King's official site on January 30. An excerpt was published in the May 15, 2015 issue of Entertainment Weekly. In 1978, petty criminal Morris Bellamy robs and murders acclaimed author John Rothstein for ending his famous Runner trilogy on an unsatisfactory note. Prior to the murder, Rothstein had been in reclusive retirement, never publishing another novel but continuing to write in private. More important than the money he steals, Morris covets Rothstein's invaluable notebooks, which contain two books which properly finish the arc of the Runner series. After the murder, Morris hides Rothstein's cash and Moleskine notebooks in a trunk buried near a creek behind his childhood home. Before he can read the manuscripts, Morris is sentenced to life in prison for another crime. Rothstein's murder is never solved. In the present day, young Peter Saubers now lives in Morris's old home. His father, Tom, was disabled in the events that opened Mr. Mercedes, and the Saubers family is on the brink of financial and emotional ruin. Peter discovers the buried trunk and secretly uses the money to keep his family afloat for the next few years, while gradually becoming engrossed in the Rothstein notebooks. When the money runs out, Pete, now a teenager aware of the true value of his discovery, comes up with a plan to profit from the notebooks. At the same time, Morris, now nearly sixty, has finally been granted parole. He goes to retrieve the buried trunk, only to find it empty. Morris is obsessed with finding the notebooks and learning the ultimate outcome of the Runner series. His search for the notebooks eventually leads him to Peter's family. As a deadly cat-and-mouse game begins, private detective Bill Hodges, the man who brought down the murderous Mr. Mercedes, is gradually drawn into the mystery of the unknown benefactor who helped the Sauberses through their rough patch. He knows young Pete is hiding something, but he doesn't know that the missing piece of the puzzle is the answer to the decades-old cold case – John Rothstein's murder. On October 10, 2017, the Audience network announced that the TV series based on the first Bill Hodges novel, Mr. Mercedes, is renewed for season 2, which will be based on original Mr. Mercedes novel, Finders Keepers and End of Watch. ^ McClurg, Jocelyn (2015-06-10). "Stephen King rules at No. 1". USA Today. Retrieved 2016-07-31. ^ "Stephen King Shares a Few More Details on Finders Keepers and Honors the Victims of Mr. Mercedes". Dread Central. Retrieved 1 June 2015. ^ "Lilja's". liljas-library.com. Retrieved 1 June 2015. 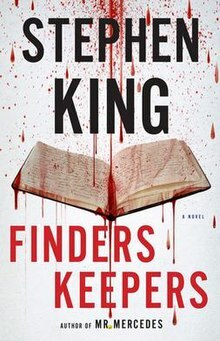 ^ "StephenKing.com - Recent News: Finders Keepers Cover Reveal". stephenking.com. Retrieved 1 June 2015. ^ "Lilja's Library - The World of Stephen King [1996 - 2015]". liljas-library.com. Retrieved 1 June 2015. ^ Flood, Alison (2015-06-15). "Finders Keepers – Stephen King's gripping sequel to Mr Mercedes". The Guardian. Retrieved 2017-01-23. ^ Maslin, Janet (2015-05-31). "Review: Stephen King Leaps Through Time in 'Finders Keepers'". The New York Times. Retrieved 2017-01-23. ^ Romeo, Nick (2015-06-18). "Stephen King revisits psychotic fandom in 'Finders Keepers'". The Boston Globe. Retrieved 2017-01-23. ^ Erik, Pedersen (October 10, 2017). "'Mr. Mercedes' Renewed For Season 2 On Audience Network". Deadline. Retrieved November 6, 2017.